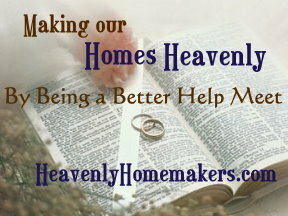 I loved all of your responses about how you are a helper to your husband. It was wonderful to establish that our role as wives is simply to be our husband’s helper. Thank you. I think we can all be encouraged to read how each of us work to meet our husband’s individual needs. I’ve read a quite few marriage books, both from Christian and secular perspectives. They were all pretty good books…but after reading them and trying to apply them…I often felt guilt and frustration. Guilt because after studying and learning about how to be a great help meet…I STILL fall way short of perfection. Frustration because there were still parts about being a help meet described in the books that I just didn’t get. How do I do this again? Why can’t I do a better job of this? What is the matter with me? Why can’t I smile at my husband adoringly every time he’s in the room? Why can’t I always meet him at the door when he gets home from work, throw my arms around him and give him a big affectionate kiss, hand him his slippers and the newspaper and massage his shoulders for thirty minutes on the sofa? Why do I STILL sometimes act irrationally about some of the things he does that frustrate me? For that matter, why…when I’m trying to do all these wonderful things to be a good help meet to him does he still do some of the same things that frustrate me? Shouldn’t the way I’m being such a good help-meet make him change all his frustrating ways? After much prayer and reflection sprinkled in with strong urges to kick, scream or break something, it has finally occurred to me that while I’m still striving toward being a perfect help-meet, I am never going to be perfect. My husband is never going to be perfect. Our marriage is never going to be perfect. We are two imperfect individuals, designed by God to be and to think very differently. Wives, some days we’re going to have sad hearts. Some days our husbands are really going to make us mad. Sometimes they will say something that hurts our feelings. Some days we will have given so much of ourselves to our home, work and children, we will feel like we have nothing to give to our husbands at the end of the day. The problem then is not in our emotions and feelings. We will all continue to occasionally feel sad, tired, mad, hurt, frustrated, over-worked, annoyed, some of the above, all of the above. None of those feelings are wrong or sinful. They’re normal, because life and marriage are full of real moments and real hard work. The problem and sin comes in how we respond to those feelings and emotions. We can say something ugly to our husbands. We can have a pity party for ourselves all day and sulk and pout. We can be short with our children. We can ignore our husbands or try to “punish” them. We can whine to a bunch of our friends about “men” and “just wait till I tell you what he did this time”. All of these responses are wrong and sinful. They may tend to be our natural responses…the easier responses…but, they are sinful. Instead, get on your knees and beg God to show you how you can respond to your feelings with grace and mercy. Anything less will just throw us into a well of self-righteous pity. I’ve been there and done that. While choosing to be merciful is A MUCH HARDER DECISION, in the long run (and because we’re trying to let God help us do things His way) our marriages will be so much more peaceful when we choose what is right. Share With Us: Just like we did in this Real Mom post, let’s all reassure each other that none of us is perfect, nor do we have perfect husbands or perfect marriages. Leave a comment to let us know that you, your husband and your marriage are all real…with bumps and road blocks (and times of bliss and merriment too). This is NOT A MEN BASHING OPPORTUNITY. This is a time to encourage each other and to let each other know that as Christian women, we are all in this together. Challenge Yourself: Think of some of the ways you respond to your husband when you are frustrated about something he’s done. Pray! – and start planning NOW for how you can handle that these situations with mercy and grace. We’ll talk more soon about some specifics and “how-tos” of choosing mercy and peace in our moments of frustration. In the meantime…let’s all take a quick moment to share that we are all real so that none of us feels like we are the only ones in a real marriage. I’m so excited to share a WONDERFUL resource with you called Empower Christian Wives. The site and all the material is written by Paul Moses, a Christian man, minister and counsellor. I know Paul personally and completely trust that he is driven by the Spirit to help empower Christian women to improve their marriages. He has helped save many marriages that were on the brink of divorce, and has improved the quality of many marriages that didn’t even know they needed improving! A few weeks ago I had the privilege of interviewing Paul and his wife Helen. It was an amazing experience for me and I know that listening to what Paul has to say will bring you encouragement. Ick, I don’t like listening to my own voice in a recording! Thankfully, all I do is ask the questions, so you’ll mostly hear what Paul has to say! It’s simply audio (because hello, I would have had to do something with my hair otherwise). The recording is set to be on a Christian radio show in Kansas sometime soon…but we’re giving you a sneak peek listen at it! It’s about 27 minutes long, so I’d say grab some laundry to fold or get a cup of tea and put your feet up for a well deserved rest.